Learn from these DVDs and practice daily at home. This program is designed to make tai chi accessible to people of all ages and abilities. 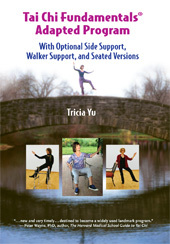 The 3 DVD Set includes DVDs for Optional Side Support, Walker Support and Seated Programs. All movement is taught in a simple-to- complex progression and can be modified to accommodate individual needs. This set is an ideal resource for personal home use as well as for community and senior centers, independent and assisted living facilities, long-term care, outpatient clinics, rehabilitation facilities, home health or anywhere where people wish to exercise with support when needed. Program Applications: Wellness, balance, geriatrics, stress and pain management, PTSD, TBI, polytrauma, autoimmune diseases, women's health, orthopedic, neurological, cardiovascular and respiratory rehabilitation.